11 and 13 are the Continental gates, while 15 and 17 are the American gates. That’s how it was laid out in the initial artist’s renderings. No. 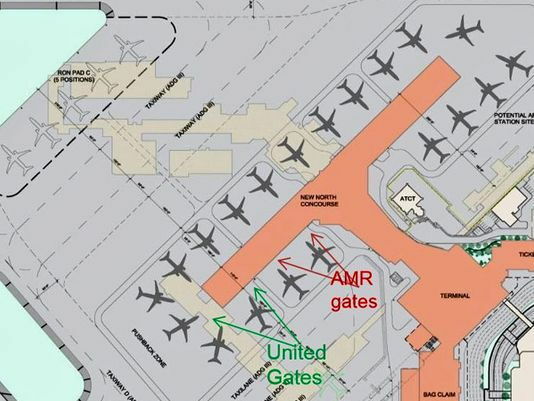 UA signed a lease for two gates while it was still operating in the old terminal. It subleased them to WN prior to the opening of the new terminal. That may well be true, but UA did fly out of new terminal. One of two flights that I booked ended up on AS, thanks to UA not having enough deicing fluid, and me hopping bus / Orange Line to DFW to fly AS to SEA, because UA was not going to be flying anytime soon. That said, I don’t know what bobOscar’s complaint with the old UA gates is at all. Yeah, it was definitely kinda ghetto, but as far as getting in and out, it was practically like flying to your own personal airport! It had its own TSA checkpoint. And the largest plane there was a 50-seater, so the lines at TSA were reliably short and occupied by, predominantly, savvy business flyers. To me, that deal was a dream that I miss severely, compared to joining the eight zillion Kettles at the new improved Southwest Airlines terminal. I know that image is the reverse of what I stated in my reply, but it’s a later rendering that in the initial pressers from 2006.
at the tine decisions were initially made, CO and UA hadn’t merged. That’s true, come to think of it. And CO also did some Q400 flights as well. But I stand by my statement- the dilapidated gates were a breeze to get into, and baggage claim was speedy as well! The gates were IMHO in better shape than what WN used, and yes easy to get in and out. Applaud for the additional services to SFO/SJC/SAN. . One can only hope that AS will add new routes to east coast. AS just axed the east coast (DAL<—>DCA/LGA) routes they inherited from VX; WN has service to pretty much every east coast city from DAL ... where exactly are you hoping AS adds service? I miss flying PDX-DFW-LGA and racking up those EQMs at .04 apiece. And AS has made it plenty clear IMHO that they have no intention of flying EAST from DAL - that was a Virgin lousy idea. They won DAL when AA was forced to divest at DAL and could not figure out what tp do with it. There are some that don't prefer MDW, LGA, or FLL. Locals would know more but I think the ORD market over the MDW market is small. This includes those from Rockford and northern Chicago suburbs, like Niles. EWR does have a big market that prefers EWR to LGA. Those from West Orange, Saddle River, Morristown, and much most of Northern New Jersey. MIA does have a market that prefers MIA to FLL, mostly the city of Miami but not Broward County. So, DAL-EWR seems like the biggest market of the three over competing airports that are served by WN. One problem is that only O&D would fly the route. Not many from SEA, PDX, SFO, SJC, LAX, or SAN would want to fly to EWR via DAL. Rifleman69, eponymous_coward and jinglish like this. I certainly can not disagree with you on that. VX couldn't make eastern flights work. There is little hope of an AS resurrection. If I were betting on additional DAL cities, and I'm not, I'd go with SNA and SMF. I have a handful of colleagues that would appreciate a SNA-DAL flight on AS. I thought having one flight from PAE would be better than 3x PDX or 4x SEA, but I suppose PAE is maxed out. You may not be aware of some obscure airports like FLL, MDW and LGA, but I assure you that WN does indeed compete in the Dallas-Chicago, Dallas-New York and Dallas-Greater Miami markets. Oh yeah, there is this other airline based in Dallas that has hubs in Miami, New York and Chicago. Damned if I can remember the name though. Can someone help me out?